After a building an impressive portfolio of work meeting partners’ needs, the beginning of the year saw the official launch of our consultancy offer and the publication of our brochure ‘Sound Solutions for the Music Education Sector’. The brochure details the wide range of services and support we offer whilst showcasing how we can adapt our expertise to meet bespoke needs. Since January we have been busy supporting organisations in developing their projects and thinking. Organisations we have worked with over the last few months include Newham Music Trust, the Roma Support Group, and the Academy of St Martin in the Fields, through acting as a ‘critical friend’, offering structured support, and collaborating on evaluation. 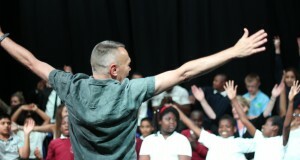 A few weeks ago we saw the very moving culmination of a collaborative project with Redbridge Music Hub, in which Graham Dowdall – one of Sound Connections’ Associate Artists – had a residency in four SEND schools in the borough. We have been commissioned by the South Riverside Music Partnership to manage and produce a termly CPD newsletter for their musicians and music teachers, which we are excited to be launching in September this year. In addition we are working with Greenwich music hub on producing a film, showcasing the diverse range of music-making on offer for young people in the borough. Our work around youth voice consultation goes from strength to strength and have recently concluded a consultation for Brighton Music Hub as well as scoping out a new youth voice project for Bristol Music Hub. We are also talking with a number of other music hubs about how we can help them develop their youth voice offer. If you would be interested in discussing how we might support the work that your organisation is doing then please contact our Director, Philip Flood, on 020 7729 7220 or email philip@sound-connections.org.uk.